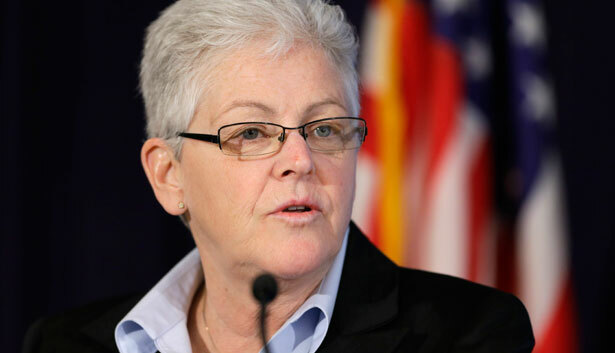 Gina McCarthy appears to have a long-term vision for combating climate change, and the experience to implement it. There are three basic things one would hope to see in the White House’s nominee for the Environmental Protection Agency. He or she should possess a big, ambitious vision for combating climate change; he or she should have federal rule-making experience, since that’s the administration’s only real hope for getting things accomplished in that area; and he or she should be able to get confirmed by the US Senate. She constructed or played a role in several pioneering cap-and-trade initiatives. McCarthy spent most of her early career in Massachusetts, eventually becoming a top environmental official for none other than Mitt Romney. She commanded the development of Romney’s “Climate Action Plan” for the state, which aimed to reduce greenhouse gas emissions to ambitiously low levels: Enacted in Spring 2004, it aimed to reduce the state’s GHG emissions 10 percent below 1990 levels by 2020. The plan called for creating an “emissions banking and trading program,” as well as using regulations to limit emissions from older, dirty power plants. The plan also called for Massachusetts to participate in a regional cap-and-trade plan with other states, something Romney pulled out of just before implementation in response to pressure from the industry and his political aides, who were eyeing a presidential run. But McCarthy quickly found a job in neighboring Connecticut, and oversaw that state’s participation in the regional cap-and-trade exchange and continued to help the multi-state initiative reach fruition. At Obama’s EPA, McCarthy oversaw the clean-air rulemaking process. Federal rulemaking is a complicated, grueling process, and so this experience is no doubt helpful—especially since the chance of Congress passing any climate legislation is vanishingly small. The EPA will be the nexus of the Obama administration’s climate efforts, and rulemaking will have to be the tool. From big things like EPA regulation of greenhouse gases to a variety of smaller but still very important matters like emissions from industrial boilers, sulfur in gasoline, coal ash disposal, soot, and water pollution, the EPA will have its hands full. McCarthy already passed Senate confirmation once. Republicans are well aware that the EPA will take the lead in the administration’s climate initiatives, and are certain to battle the EPA nominee regardless of who it is. McCarthy will no doubt face stiff opposition. But insofar as a nominee can be resistant to GOP opposition (and still be a strong pro-environmental choice), McCarthy fits the bill. But still, if McCarthy was acceptable in 2009, why not now? Even Senator James Inhofe, a climate-denier extraordinaire, supported her nomination, and as Rebecca Leber at ThinkProgress catalogues, an impressive number of industry groups have positive things to say about McCarthy. Ultimately, this is a very strong nomination from the White House. McCarthy isn’t perfect—to the extent one wants to credit her with EPA rulemaking success over the past four years, she must also be blamed for its shortcomings—but she satisfies a number of crucial requirements and has the strong support of environmentalists in Washington. Senator Barbara Boxer made it clear long before the McCarthy’s nomination that she was the senator’s preferred candidate. Major environmental groups have offered unqualified support. A tough confirmation fight and far, far tougher rulemaking battles await, but this is a good first step. In worse news on climate change, the State Department's falseheaded review of the Keystone pipeline's environmental impact is another step toward its approval, George Zornick writes.